Grand Chief Ed John (Akile Ch’oh) of the First Nations Summit speaks at the media conference held by the five Nations following the release of the justification trial decision. April 19, 2018, Vancouver. Photo: Melody Charlie. February 11-15, 2019: The five Nations appeal the justification trial based on 1) the reinterpretation of the right takes a very narrow approach to Aboriginal rights; 2) rewriting the definition of the proven right in a trial that was supposed to be about justification; 3) artificial restrictions on the exercise of the Nations’ fishing rights (e.g. using ‘small, low-cost boats with limited technology and catching power’); and 4) the potential involvement of sector-based interest groups in Nation-to-Nation discussions. November 30, 2018: Working on timelines associated with the justification trial, DFO delivers an offer to the five Nations that would see a reduction in the Nations’ existing salmon demonstration fisheries, and marginal opportunities for other species. November 14, 2018: Representatives of the five Nations meet with Minister Wilkinson (Fisheries) in Vancouver to request that the Minister champion a new relationship and the Term Sheet with the five Nations. August 2018: Representatives of the five Nations work with other First Nations organizations to provide friendly interventions on behalf of the five Nations. April 19, 2018: The decision in the justification trial is released. While several aspects of the decision are positive for the Nations, there are many troubling findings and conclusions that should be of significant concern to all First Nations. Shortly after the justification trial decision is released, the five Nations file notice to appeal. March 13, 2018: Representatives of the five Nations meet with Minister LeBlanc, Parliamentary Secretary Terry Beech and senior DFO and ministerial staff in Campbell River. Minister LeBlanc commits to supporting the MC when it gets to Cabinet, and also to delivering on the interim access provided in his February 14 interim offer letter. February 14, 2018: Concurrent with a major speech by Prime Minister Trudeau on reconciliation with First Nations, Minister LeBlanc writes to the five Nations with an interim offer of licences and quota pending consideration of the MC. The letter lacks detail regarding flexibility for the Nations to fish the access offered through rights-based, preferred means fisheries as laid out in their fishing plans. The letters also contains no offer of increased access for Chinook salmon, though reference is made to continued work by DFO staff to increase access to Chinook for the five Nations in 2018. March 2017 – October 2017: The five Nations enter into a ‘reconciliation process’ led by senior staff from INAC and DFO. The result is a jointly developed ‘Term Sheet’ that is supposed to be incorporated into a Memorandum to Cabinet (MC) that will set the stage for implementation of the Nations’ fishing plans. Cabinet consideration of the issue is put off until spring 2018. October 28, 2016: This ended 144 days of the justification trial. All those who were able to attend were impressed by the logical and compelling arguments of the Nations’ legal team, Ms. Lisa Glowacki and Mr. Matthew Kirchner. They provided a very clear description of the Nations’ fishing plans, of the rationale for the allocations, and of the law that supported the Nations’ argument. By the end of the oral submissions, Justice Humphries was asking insightful questions that demonstrated her understanding of the issues. Most importantly, the Nations’ legal team made clear what was at stake: the future of the Nuu-chah-nulth fishing culture. October 11, 2016: Today was the day when, finally, the Nations’ legal team could begin to lay out its case that Canada had not justified its infringement of the Nations’ right to fish and sell fish, and to refute the legal arguments and misinterpretation of evidence by Canada’s and the intervenors’ legal counsel. 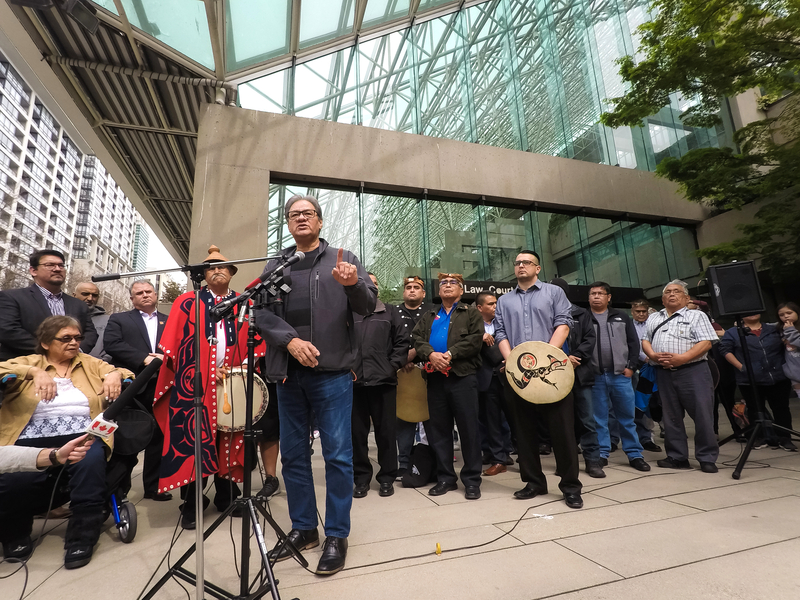 After enduring frustrating presentations by Canada for 11 days and the intervenors for an additional two days, the five Nuu-chah-nulth First Nations’ legal team, Mr. Matthew Kirchner and Ms. Lisa Glowacki, began their legal argument in B.C. Supreme Court for the Nations’ case, Ahousaht et al vs. Canada, and to correct the many misrepresentations of the evidence. September 21, 2016: Today marked the first day of oral summary arguments in the justification trial. Canada and the Nations’ legal team tabled their lengthy written arguments and responses to the other Parties arguments during the summer. As with the evidence portion of the trial, Canada went first in presenting its oral argument. Eventually the case will decide whether Canada can justify its infringement of the Nations right to fish and sell fish, and what remedies the Nations will receive if Canada cannot. June 28, 2016: A small delegation representing the five Nations meet in Ottawa concurrently with Minister LeBlanc (Fisheries), Minister Bennett (Indian and Northern Affairs Canada – INAC) Minister Wilson-Raybould (Justice) and senior staff from all three departments. The Ministers promise a new relationship with the five Nations and action on the file. March 15, 2016: Today marked the last day of evidence in the justification trial. Later this summer lawyers on both sides will provide written arguments, after which time the trial will resume in summer or early fall for oral arguments. The Judge will then consider the arguments and evidence presented and issue a decision, likely several months after final arguments are made. There is also still the opportunity for the new Federal government to reconcile the Aboriginal fishing rights of the five Nations with Canada’s legislative responsibilities. The Honourable Hunter Tootoo, Minister of Fisheries, Oceans and the Canadian Coast Guard, is aware of the interests of the five Nations to discuss alternate means for resolving the few but significant outstanding issues. March 9, 2016: The trial relocated to the Nuu-chah-nulth community of Ahousaht on Flores Island in Clayoquot Sound for one day. In this remote community off Vancouver Island’s west coast, the B.C. Supreme Court heard the final witness for the Nations, Autlieyu (Francis Frank), Chief Councillor and lead negotiator for Tla-o-qui-aht First Nation. The trial resumed in Vancouver on Friday, March 11, with the continued examination of Autlieyu. After the trial concluded at noon, Ahousaht Ha’wiih invited their guests, including many visiting Ha’wiih, Chiefs and fishers from other First Nations, to a seafood lunch in their Thunderbird Hall. Guests and Ahousaht community members were treated to halibut, salmon, prawns, crabs and clams before making their way safely back to Tofino and their homes, well before the expected high winds arrived. January 18, 2016: The Court reconvened in Vancouver to hear the Nuu-chah-nulth case. From January 18 to March 15, the BC Supreme Court heard 10 witnesses over 24 trial days. The witnesses called were as follows: Dr. Don Hall, Fisheries Program Manager, Uu-a-thluk; Alex Gagne, T’aaq-wiihak Fisheries Coordinator; Andrew Webster, an experienced Ahousaht fisher; David Miller from Ehattesaht; Will Amos of Hesquiaht; Ken Watts, Vice-President, Nuu-chah-nulth Tribal Council and a Tseshaht member; Joshua Charleson, a 26-year-old Hesquiaht fisher; Dr. Gary Morishima, an expert witness (Dr. Morishima has worked extensively with the US Tribes in Washington State in fisheries management, assessment, and implementing the Boldt decision, which provides 50% of the fisheries access to the Tribes); Jamie James, a Mowachat/Muchalaht member; and Autlieyu (Francis Frank), Chief Councillor and lead negotiator for Tla-o-qui-aht First Nation. February 8–12: There is no trial scheduled this week. December 15, 2015: Canada’s direct evidence concluded on this day. Canada called 25 witnesses (24 from DFO) over 108 trial days. September 8, 2015: The five Nuu-chah-nulth First Nations returned to court after the summer months for the Justification trial, which began Day 56. Canada continues to provide evidence. March 9, 2015: The five Nuu-chah-nulth First Nations returned to court for a Justification trial at which time Canada will attempt to justify why the Nuu-chah-nulth Nations were not previously (or historically) given the right to harvest and sell all species of fish in their territories. Canada will provide evidence first and Nuu-chah-nulth witnesses will give evidence in May or later. January 30, 2014: The Supreme Court of Canada denies Canada’s request seeking leave to appeal the Nuu-chah-nulth fishing rights decision. The 2009 declared fishing rights of Nuu-chah-nulth Nations are now final and constitutionally protected under Section 35 of the Canadian Constitution. Canada cannot appeal the decision again. Read the press release. September 26, 2013: Canada files an appeal of the recent B.C. Court of Appeal decision to the Supreme Court of Canada (SCC). This is Canada’s second request to the Supreme Court of Canada in the case. July 2, 2013: The BC Court of Appeal upholds rights of five Nuu-chah-nulth Nations to fish and sell fish commercially a second time. Read the full decision from the B.C. Court of Appeal. February 2013: The BC Court of Appeal reconsiders the Ahousaht et al vs. Canada court case as directed by the Supreme Court of Canada in light of the Lax Kw’alaams decision. A second appeal hearing takes place in Vancouver. May 18, 2012: Five Nuu-chah-nulth Nations file a Notice of Intention to Proceed with the next stage of the Ahousaht et al vs. Canada court case. This involves going back to the BC Supreme Court to address the question of “justification” that was left unanswered at the conclusion of the original trial. March 29, 2012: The Supreme Court of Canada refuses to hear Canada’s appeal of the Nuu-chah-nulth Fishing Rights decision and remands the decision back to the BC Court of Appeal in light of the Lax Kw’alaams decision. August 17, 2011: Canada applies to the Supreme Court of Canada for permission to appeal the B.C. Court of Appeal decision affirming the aboriginal rights of five Nuu-chah-nulth Nations to fish and sell fish. The Supreme Court of Canada will issue its decision on whether or not to hear the appeal in the coming months. May 18, 2011: The B.C. Court of Appeal unanimously affirms the right of five Nuu-chah-nulth First Nations to harvest and sell any species of fish in their territories (with the exception of geoduck clams). The Court of Appeal upholds the November 3, 2009 decision of the B.C. Supreme Court recognizing the Nuu-chah-nulth as having these rights, based on the central importance of fishing and trading fish throughout history. Read the full Appeal Court decision. December 6-10, 2010: Nuu-chah-nulth Nations and supporters gather in Vancouver to hear submissions in Canada’s appeal against the Nuu-chah-nulth Fishing Rights decision. Ha’wiih, fishermen, community members, youth, and leaders pack the courtroom as Canada, Nuu-chah-nulth Nations, and intervenors make their submissions. At the end of the the five days, the Appeal Panel Justices reserve their decision. Parties expect to hear their decision within 3-9 months. Read the full article. November 3, 2010: Justice Nicole Garson awards Nuu-chah-nulth First Nations “special costs.” She orders that Canada is responsible for 85% of the trial costs incurred by the Nations involved in the case. Read the press release for more details. June, 2010: Hearing dates for Canada’s appeal of the Nuu-chah-nulth Fishing Rights decision are set for December 6-10, 2010. December 3, 2009: Canada appeals the decision while the clock on court-imposed negotiations continues to tick. While awaiting for Canada to enter into negotiations, Nuu-chah-nulth Nations and the Tribal Council continue work developing Nuu-chah-nulth fisheries that will benefit fishermen and communities in accordance with the decision. November 3, 2009: Justice Nicole Garson rules the Nuu-chah-nulth First Nations have an Aboriginal right to harvest and sell all species of fish found within their territories. Justice Garson orders Canada to negotiate with the Nations about how to accommodate their right within its management of the fisheries. Read the press release for more details. March 25, 2009: Nuu-chah-nulth Nations and Canada conclude oral submissions. The case goes to the Judge for her deliberation and decision. March 9, 2009: Nuu-chah-nulth Nations and Canada return to court for three weeks of oral submissions that highlight, recap, and summarize evidence and legal principles for the Judge. Due to a developing position on reconciliation with First Nations in the province, British Columbia decides not to present a written argument or participate in the closing arguments. March 2, 2009: Lawyers working on behalf of Nuu-chah-nulth Nations provide a final written submission totalling 522 pages to the Court. The written argument sets out the legal principles that form the basis of the Nuu-chah-nulth case and summarize the evidence presented over the 110 days of trial. November 21, 2008: After 111 days of trial, the evidence part of the case over. The trial adjourns until March 9, 2009, when parties will return for three weeks of closing arguments. In the meantime, lawyers representing Nuu-chah-nulth Nations will prepare the substantial written argument. June 2008: After five months of testimony, witnesses presenting on behalf of Nuu-chah-nulth Nations conclude their evidence in the case against Canada and British Columbia. In the next portion of the trial, Canada will enter evidence through witnesses and the Plaintiffs will conduct cross-examinations. The trial is scheduled to continue until late in 2008. May 16 – June 4, 2008: Plaintiffs call their final witnesses, including Simon John, Troy John and Victoria Wells (Ehattesaht), John Frank (Ahousaht), and Chuck McCarthy (Ucluelet), and Barney Williams Jr. (Tla-o-qui-aht). April 21-May 16, 2008: Allen Wood continues his testimony. Following Mr. Wood, Christine Jules of Ka:?yu:k?t?h?/Che:k?tles7et?h describes the importance of fishing to her community and its decline. On April 29, Uu-a-thluk Program Manager, Dr. Don Hall begins his testimony, giving evidence of Nuu-chah-nulth attempts to increase access to economic fisheries and describing the inadequacy of commercial fishing opportunities provided to the Nuu-chah-nulth through existing or past DFO programs. He provides examples of how requests to change licensing and quota rules to allow for community-based fisheries with greater Nuu-chah-nulth participation ranged from licence splitting for the salmon fishery to trap-sharing for crabs. Dr. Hall uses the Makah Nation and their economic access as an example of how fisheries can be conducted to increase the benefit to community members. March 14-April 11, 2008: Three witnesses testify during this period: Anthropologist Richard Inglis talks about Nuu-chah-nulth society, settlements, and economy, and provides an overview of Nuu-chah-nulth fisheries from 1871-1930s; Allen Wood, formerly of the Department of Fisheries and Oceans, describes the management factors that led to the decline of Nuu-chah-nulth involvement in fisheries since 1960; and Alex Short of Ka:?yu:k?t?h?/Che:k?tles7et?h talks about his Nation?s once extensive involvement in fishing in contrast to the present day. February 27-March 14, 2008: Lillian Howard completes her earlier testimony. Other Nuu-chah-nulth-aht also present evidence about fisheries resources within Nuu-chah-nulth territory and about individual and community attempts to stay involved in commercial fishing. Witnesses include Ray Williams and Edwin Jack (Mowachaht/Muchalaht), Simon Lucas (Hesquiaht), and Benson Nookemis (Huu-ay-aht). February 25-27, 2008: Dr. Daniel Boxberger presents. Head of the anthropology department and a professor of anthropology at the University of Western Washington, Dr. Boxberger?s testimony integrates available evidence within a theoretical framework, demonstrating the existence and importance of economic trade in fisheries resources to Nuu-chah-nulth society. February 12, 2008: Over 150 people representing 40 Nations and Tribes rally at the Vancouver Law Courts in support of Nuu-chah-nulth Nations. Hosted by Nuu-chah-nulth Nations and B.C. Regional Chief for the Assembly of First Nations, A-in-chut (Shawn Atleo), the rally includes words of support from Chief Doug Kelly, Sto:lo Chief and Chair of B.C. First Nations Fisheries Council; Grand Chief Stewart Phillip and Chief Robert Shintah from the Union of B.C. Indian Chiefs; Chief Roger William from the Tsilhqot?in Nation; and Tom Happynook, President of the Nuu-chah-nulth Tribal Council. February 4-15, 2008: During this first two weeks of the 2008 portion of trial, the Plaintiffs present an updated opening statement, and evidence is heard from the Plaintiffs? first expert witness, Dr. Alan McMillan, and from Nuu-chah-nulth witnesses Julia Lucas (Ahousaht/Hesquiaht) and Lillian Howard (Mowachaht/Muchalaht). February 4, 2008: Eight Nations resume the trial to have their rights and title to sea resources recognized, respected, and implemented. The remaining three Nations will proceed in a separate phase of trial. October, 2007: The Nuu-chah-nulth Fisheries Litigation is moving ahead with a two-phase approach and a new time frame. For more information about these developments, click here. July 31, 2007: Madame Justice Garson rules that only Nuu-chah-nulth Nations without overlapping title claims can proceed in the next stage of the trial. The decision sets in motion an accelerated series of meetings and modern day agreements between Nations to resolve many of the outstanding overlaps. Summer 2006: Preparation for the second phase of the trial continues. Canada and B.C. have requested examinations for discovery of several Nuu-chah-nulth First Nation representative plaintiffs starting in August. May 19, 2006: The first phase of the Nuu-chah-nulth Fisheries litigation adjourns after hearing final testimony from Robert Dennis. Dennis informs the trial about the Huu-ay-aht history he learned from his elders and his own experiences growing up in a fishing family. Dennis also explains the territories and relationship between Huu-ay-aht Ha’wiih (Hereditary Chiefs). May 15 – 18, 2006: Dr. Lane completes her testimony. Robert Dennis, Chief Councillor of Huu-ay-aht First Nation, begins his presentation of evidence. May 8 – 12, 2006: The Fisheries Litigation resumes at the Vancouver Law Courts. Dr. Barbara Lane testifies. May 1 – 2, 2006: The B.C. Supreme Court moved to Ahousaht for two days of trial. The Ahousaht Ha’wiih welcomed the visitors to Ahousaht Monday morning before the trial began. The school gym was transformed into the courtroom. A-in-chut (Ahousaht Ha’wilth Shawn Atleo) and Ahousaht elder Stanley Sam testified in Ahousaht. The entire Ahousaht community showed that Nuu-chah-nulth are always good hosts, feeding and taking care of over 100 people, and transporting about 50 people back and forth from Tofino each day. April 24 – 28, 2006: The trial began April 24th. A gathering was held on the Courthouse steps prior to trial beginning. Over 120 Nuu-chah-nulth, First Nation leaders, and supporters gathered to show their support for the Nuu-chah-nulth Fisheries Litigation. NTC President Francis Frank and Che:k:tles7et’h’/Tla-o-qui-aht elder Barney Williams Sr. appeared as witnesses in the first week. On Friday Dr. Barbara Lane was qualified as an expert witness.